Ford Motor Company representatives join Dave Wilson and Preston Ford to celebrate placing 63rd in the US in 2016. 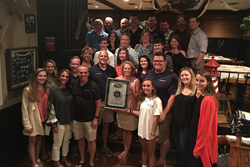 Ford Motor Company Representatives joined Dave Wilson of Preston Ford at the Crab Claw on August 17th to present Dave and his team the prestigious Ford One Hundred Club Award. For the 6th time in the past 7 years Lisa Vigneault of Ford Motor Company was able to present the Preston Ford team the Top 100 award. In 2016 Preston achieved the ranking of #63 in the Nation of all Ford dealers. “Preston Ford Lincoln continues to amaze many of us at Ford! They finished in the Top 100 Ford dealers in the nation based on new vehicle sales volume in 2016 when they are in a town of 800 people. We are so proud of their accomplishment again this year,” stated Lisa Vigneault. The smart and efficient Ford products, strong support from the manufacturer, and the same shared values and leadership of Bill Ford and his team, attribute to the individual dealer success. Along this line, the Preston Automotive Group has a simple, strong company mantra… SHOW THE LOVE DAILY. This simple belief integrated with strong family values and deep core business values, relates to all aspects of the Preston teams success. The goal at Preston is to show the love daily to customers by exceeding their expectations at every visit and making sure the customer knows how much their business, time and relationship is valued. The love doesn’t stop with the customer though, Preston engages the employees with daily training and support to make the job of taking care of the customer #1 priority. “We know it is the love and loyalty of our customers that get us to the Top 100 and we cannot thank them or show them the love enough,” says David Wilson, Jr. Preston Automotive Group Vice President. Although the Mission Possible sales event created by David Wilson, Jr., hits hard at the end of the year making it the busiest time of the year for the Preston Team, it is the true team spirit and community involvement throughout the year that makes the Top 100 possible. Ranking the 63rd Ford Dealer in the Nation out to nearly 3,300 Ford Dealerships in the United States in a town of a population of about 800 people, Preston Ford shows it’s not just the destination but the experience. As a Top 100 dealer Preston Ford offers acres and acres of inventory that can be viewed online at prestonmotor.com or visit any of the Preston Automotive Groups five Ford locations at Preston Ford Lincoln, Denton Ford, Pittsville Ford, and Boulevard Ford Lincoln of Georgetown and Lewes. Preston Automotive Group serves the Delaware, Maryland, Virginia and Pennsylvania areas with Ford, Lincoln, Mazda, Hyundai, Nissan, Chrysler, Dodge, Jeep, and Ram brands. The auto group carries the largest selection of new and used cars and trucks. Additionally, the dealership services all makes and models, both imported and domestic cars with ASE certified and factory trained technicians. To further serve your automotive needs the Preston Automotive Group is also home to three auto body shops conveniently located around Delmarva in Preston, Cambridge, and Snow Hill, Maryland. Earlier this year Millsboro Chrysler, Dodge, Jeep, and Ram broke ground in Millsboro on their new state-of-the-art facility.